“Mirai no Neiro-Sound of the Future-” is a fan-run panel featured at conventions around the world. It is run by a group called Delusion Production House (D.P.H). The main purpose of Mirai no Neiro is to send out information about Vocaloids from Japan to people around the world. 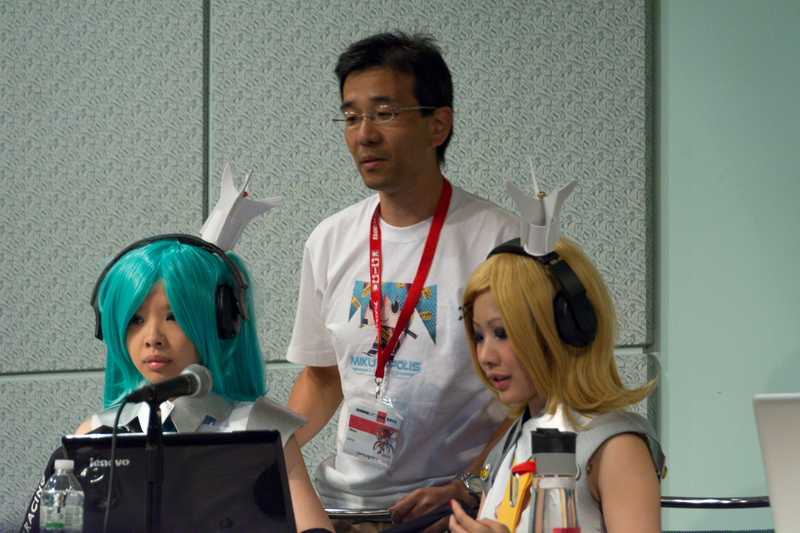 This year at Anime Expo, Mirai no Neiro had two panels on July 5th, 2013. Part 1 of the panel featured a music video screening and fly screen projection concert. Part 2 featured VocaloP guests and a screening of their music videos. DPH got permission to use all the material in the panel from the original content creators. Despite being one of the first panels of the day, the queues were long and the room was packed. A large fly screen and projector was set up at the front of the room next to the panelists’ table. 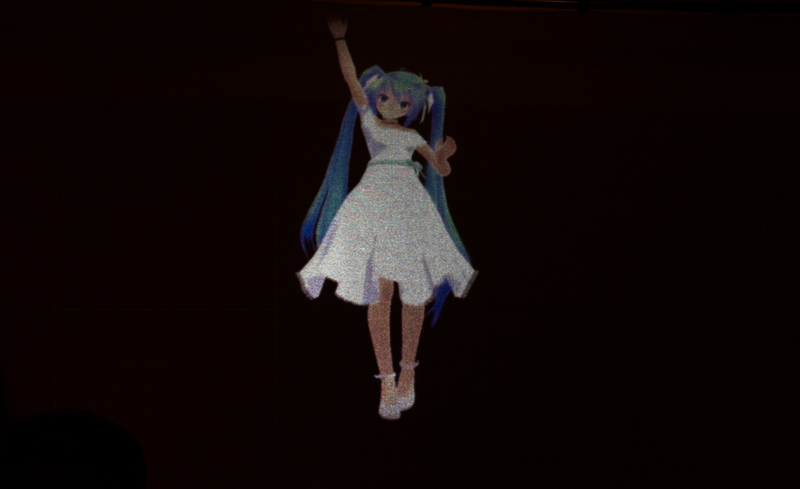 Fly screens are made of mosquito net screens and are used to mimic the “3D” effect of DILAD screens often used in large-scale Miku concerts such as Mikunopolis. As people were finding their seats, a promotional video for God Eater Burst played on the fly screen. This may seem unusual, but Tennen, one of the VocaloP guests, is a scenario writer for the game. The lights were dimmed and the opening video started playing on the fly screen. The video was created by G2 and featured the song “Gian’s Recytal” by Zanio. The video was a fusion of MMD animations and live action footage. 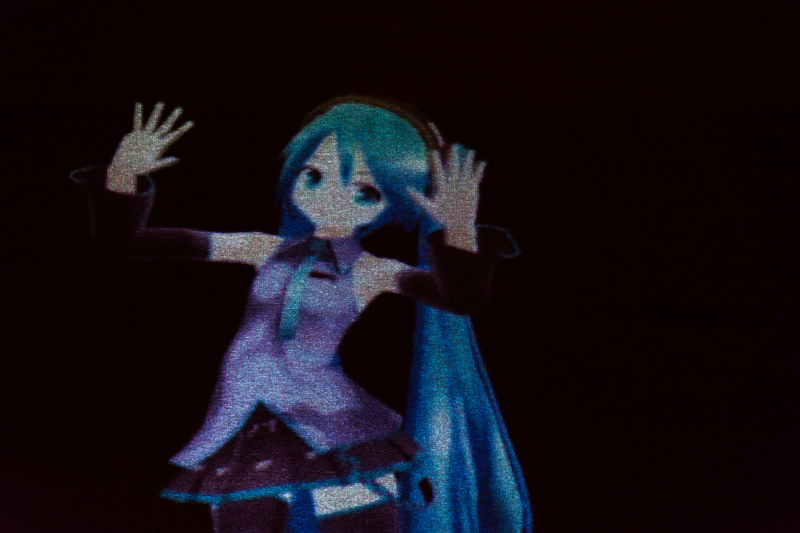 It showed a lady traveling around a Japanese city with Vocaloids and Vocaloid related displays. Midway, the video takes a dramatic change in tone and the music becomes more intense. Suddenly there’s Mikudayo eerily dancing! And finally all the Crypton Vocaloids gather together once more and the logo for “Mirai no Neiro” appeared. Next, the MCs read messages from the creators of the videos. The two MCs were in Good Smile Racing 2013 Miku and Rin outfits. In order to impersonate the VocaloPs, they read their messages in different voices. First, they read off Zanio’s message in a deep voice, “I am not a socialist, Dixie Flatline is the only socialist here.” This was probably in reference to his song The Socialist which was shown at Mirai no Neiro 2 years ago. Immediately after, the music started playing. 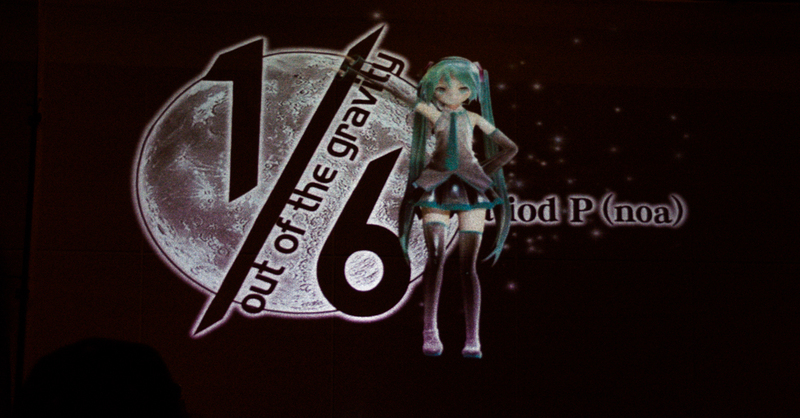 This projection concert was similar to other screenings at different events. 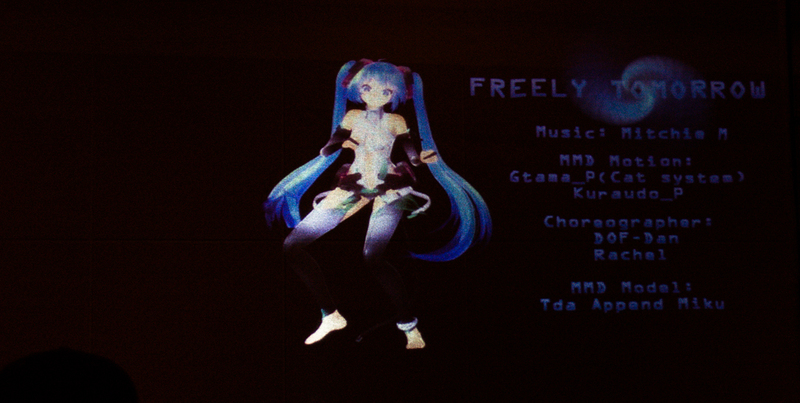 It consisted mostly of a MMD model dancing on a black background. Below I provided a list of the songs and links to the original song (not the MMD animation). Note, the version used in this screening is the English version featured on livetune’s album Re:Dial. The English lyrics are by Water Knee and programming support by Circus-P. This was originally shown at Mexico’s Expo TNT’s Mirai no Neiro panel. 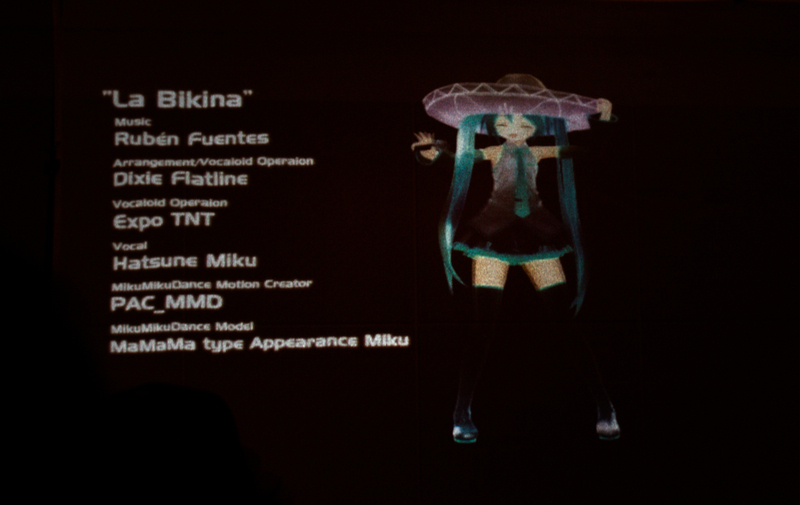 This features Miku singing a cover of a Spanish song while wearing a sombrero. Unfortunately, unlike the Expo TNT screening, no mariachi band accompainment. Overall the set-up was nice and the screen was flat enough so the projected image was not too distorted. The lighting was better this year with the lights dimmed enough. However, the projector’s glare was very bright for any unfortunate people sitting in the middle (like me). Occasionally, the audience clapped to the beat of the song, sometimes led by certain red-shirted individual waving light sticks. 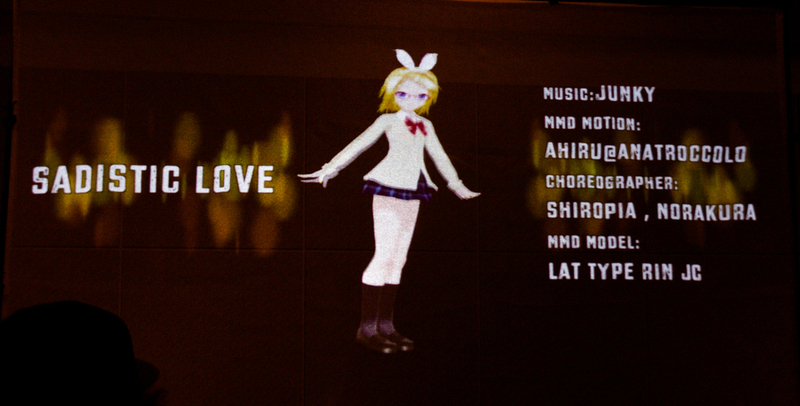 The song choice was a good mix of well known songs and MMD models. The inclusion of the Spanish song “La Bikini” was unexpected, but an interesting treat. 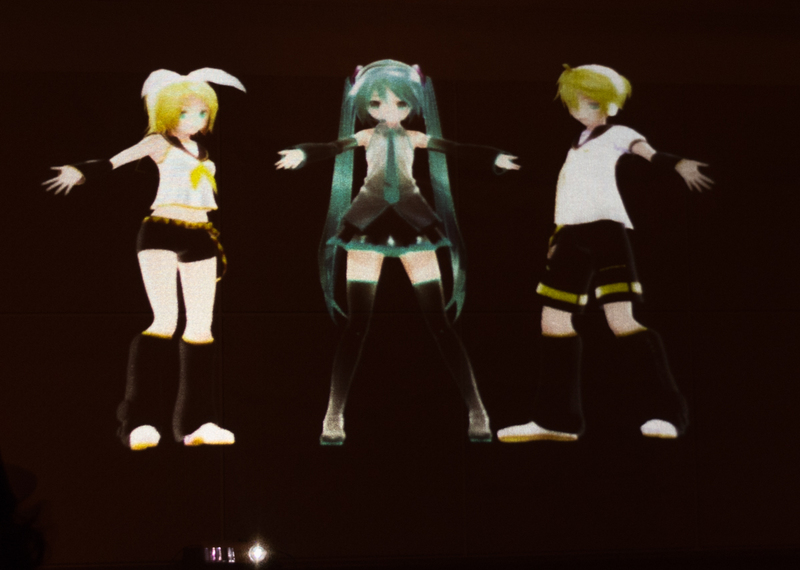 After the last song, Miku, Rin, and Len appeared on the screen once more asking if everyone had fun and thanking everyone for coming. 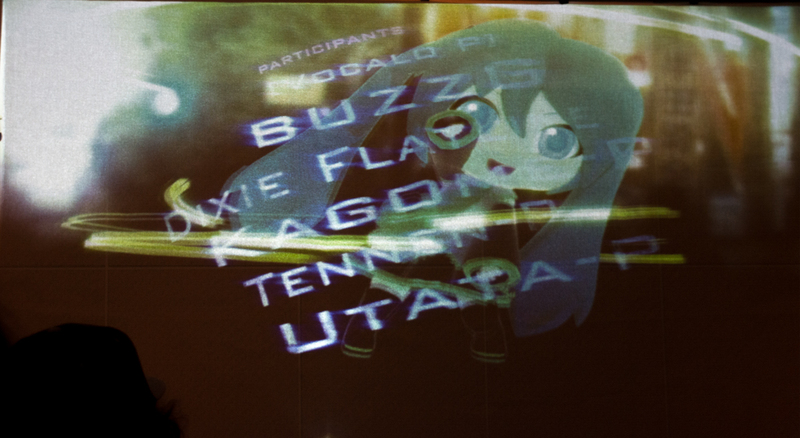 The next part of this panel was a screening of Vocaloid music videos. These were shown on the large regular projector screens. All the videos have now been uploaded online by their creators, so check them out below. First up was the world premiere of the music video from Penguins Project, a VocaloP who was a guest for Mirai no Neiro in 2011. The song is a GUMI song called “Galapagos Girl” featuring illustraions by yuna and arrangement by KagomeP. Penguins Project uploaded the song on NicoNico a week or so after the convention. The MCs read off Penguins Project’s message. It’s been 2 years since he was in America and there isn’t anything in Japan like the blue skies and dry air of Los Angeles. Nor are there giant hunks of steak. The panel today showed the PV for the song Galapagos Girls, which is on his second album Galapagos. He calls the song a “mysterious mix of Tokyo and Galapagos Island” and he hopes everyone will enjoy it. Also, you can buy his album Galapagos on US iTunes. Next was an English Luka song by K called “Q-est”. As usual, the MCs read off K’s message. K thanked everyone for coming to Anime Expo. He then said his twitter ID is @KKK_KKK2 and asked people to follow and become friends with him. The last song was from a creator from Mexico called Ankari. “Hello, I’m Ankari, a Vocaloid producer who makes Vocaloid songs in Spanish! Thank you for supporting and listening to Vocaloid music. Vocaloid fandom exists everywhere in the world. There are Vocaloid Ps everywhere who make original music in most languages. If you haven’t listened to Vocaloid music in languages other than Japanese before, I hope you can give everyone a chance too! The MCs then introduced the organizers of the Mirai no Neiro panel. The MCs then ending the panel with their own message: Vocaloid is a software program that everyone can try using, and Japanese Vocaloid fans are waiting for American Vocaloid creators to appear on the scene. They’re hoping one day video sharing sites will be filled with American producers songs. And that’s the end of Part 1 of the Mirai no Neiro –Sound of the Future– panel!